New Zealand's men and women complete a clean sweep with double success at Rugby World Cup Sevens success in Russia. The sixth Rugby World Cup Sevens, and the second to include both men’s and women’s competitions, was held in Russia’s capital Moscow in June 2013 and will not be quickly forgotten for a number of reasons. Firstly, the fact that rugby sevens’ premier event was played out in a country and a culture so new to many brought immediate change. Moscow’s weather was also a talking point from arrival to departure, and would have a major impact on the tournament. In the week leading up to the tournament the city was sweltering in its highest temperatures for over 100 years, making training gruelling and attritional at best, and while the balmy heat would persist into the weekend, it would also be interspersed with electrical storms severe enough to bring an abrupt halt to the men’s semi-finals and, for a while, bring the television satellite operation to its knees. As significant to the end result, the ensuing quagmire left the players slithering and sliding through the finals. Another point of note was the remarkable National Olympic Centre, where both competitions were held, and the 80,000 seater Luzhniki Stadium that provided the focal point of the action. Defending champions Australia were joined in the 16-team women’s draw by Brazil, Canada, China, England, Fiji, France, Ireland, Japan, the Netherlands, New Zealand, hosts Russia, South Africa, Spain, Tunisia and the USA. Rising to the occasion, hosts Russia provided the story of the women’s pool stages. They followed a win against Japan and a draw with France with a dramatic 17-15 shock win against England to top their pool. Coach Pavel Baronovsky was too hoarse to speak after the match, but the prevailing sentiment was one of extreme pride. The Russians would come unstuck in the quarter-finals, losing narrowly against a fine Canadian side who themselves went on to reach the final with a win over surprise package Spain. In the end, though, nobody would have an answer to New Zealand, who arrived in Moscow as the inaugural IRB Women’s Sevens Series champions and ran out 29-12 winners against Canada with Portia Woodman and Kayla McAlister standout players. Woodman gave New Zealand the perfect start by going under the posts and Kelly Brazier followed soon after for a 12-0 lead early on. Canada hit back through Arielle Dubissette-Borrice, but Honey Hireme’s try ensured a 17-5 lead at half-time for New Zealand. Ghislaine Landry reached over to score and convert her own try to make it game on for Canada in their first World Cup final, but they couldn’t get the next score with Woodman and then McAlister touching down to ensure New Zealand could celebrate come the final whistle. Woodman’s double meant she finished the tournament with 12 tries, easily beating the previous benchmark of nine tries set by compatriot Carla Hohepa in 2009 when New Zealand lost the final in extra time to Australia. The 24 nations in the men's draw were Argentina, Australia, Canada, England, Fiji, France, Georgia, Hong Kong, Japan, Kenya, New Zealand, the Philippines, Portugal, hosts Russia, Samoa, Scotland, Spain, South Africa, Tonga, Tunisia, Uruguay, USA, defending champions Wales and Zimbabwe. The tournament went largely to form, Wales providing the biggest shock across the six pools with victory over two-time champions Fiji, but their title defence came to an end against New Zealand in the quarter-finals. In the same half of the draw Fiji edged South Africa and in the bottom half England beat Australia by a single score and Kenya needed extra time to see off France. The rest of the knock-out stages fell prey to the spectacular weather, the lightning overhead forcing Fiji and New Zealand off the pitch on safety grounds with the All Blacks Sevens leading 17-0. When play eventually resumed, neither side managed to produce enough cohesive play to create a scoring opportunity. The conditions under foot were no better when England overcame Kenya 12-5, but in the final England, coached at the time by Ben Ryan, simply had no answer to New Zealand who coped better with the conditions both physically and mentally, and were more tactically astute with the ball. From the moment Tim Mikkelson picked a line and waltzed through the England defence to open the scoring, New Zealand were in control. Two more tries, from Tomasi Cama and Mikkelson, gave them a 21-0 lead and when Waisake Naholo went over two minutes into the second half the game was done. Gillies Kaka crowned a superb individual performance with a final try to make it 33-0 and all of New Zealand kicked off rapturous double celebrations with their men and women, already series champions, adding the RWC Sevens titles to the World Cups they held at the time in 15s. Coach Gordon Tietjens: “It is awesome, a long time between drinks since 2001. We started slowly but we got that buzz going today. We talked about this buzz and we adapted to the conditions well, and the game plan was executed so well. Captain DJ Forbes: “I am so proud, a special moment, especially for me being injured this year and to come back and do this, at a World Cup with this pressure, this is really special. The conditions were hard, we thought we were playing cricket for a minute, getting rained out in the semis. But they were tough, we stuck to our guns though and came out with the win. Captain Huriana Manuel: “It feels amazing to be world champions. We have worked so hard for each other and we left it all out there on the field. I am so proud. The weather conditions were hard but we expected to have to be able to cope with it. 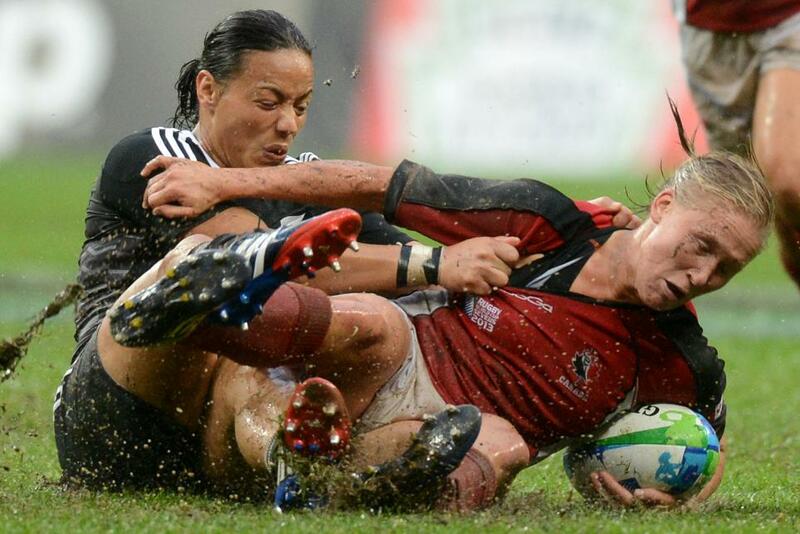 Portia Woodman, top try scorer at RWC Sevens 2013: “It is amazing. I can’t explain it. A year ago I never thought I would be here. It’s great to score tries but I didn’t even notice how many. That is my job. The forwards get me the ball and it is my job to finish it.